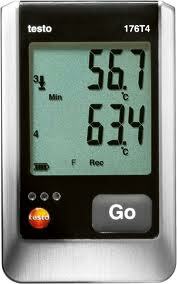 You can measure and document flow and return temperatures with the testo 176 T4 at 4 different places, for example at the distributor og an underfloor heating system, in order to test its functionality. The requirements of a many different applications can be fulfilled using a broad range of connectable thermocouple probes (Type K, Type T, Type J). 466 TruReward$ points will be placed in your account when you buy this item.